This is Miriam, the mysterious tomato plant when I started to feature her in my gardening column. Let's see, it's been three months since Miriam the tomato seedling was potted and brought inside. I call her the mystery tomato because I don't know what kind of tomato she is, and her original owner Tom can't remember, either. Now you know and we will all be surprised once the tomatoes ripen. Most people have told me they assume they can't grow tomatoes inside in a pot, tomatoes can only grow on a farm. Or outside in a garden plot. Contrary to popular belief, tomatoes can be grown in a pot indoors. And yes, Miriam has baby tomatoes and appears to be growing even more. Since I mentioned growing, Miriam is also now almost 3-feet tall so I had to stake her with longer rods to keep her stems from falling over. 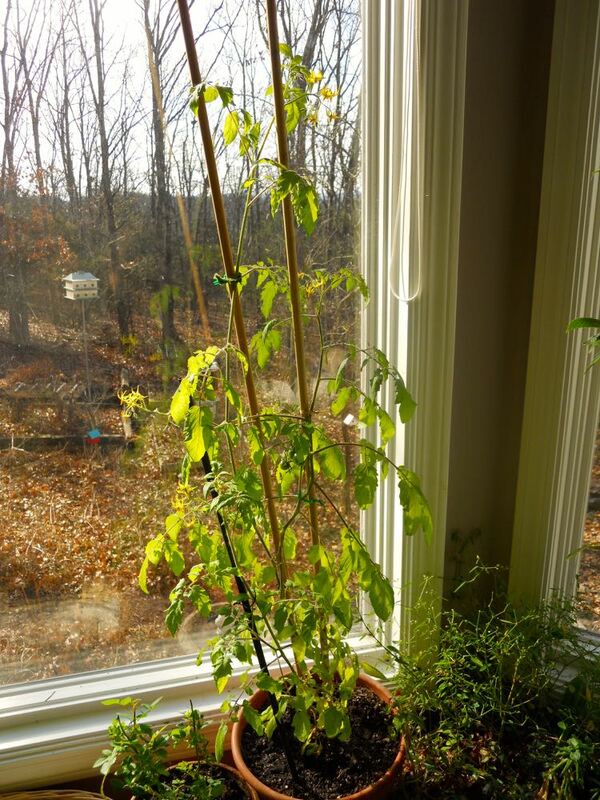 Miriam Tomato spends her winter days keeping Razel Rose company in one of my bay windows. When I first spotted fruit, there were three. Now there are more than five, in part due to my hand pollinating the delicate yellow flowers with a Q-tip. Miriam Tomato has officially set fruit and should be having ripened tomatoes in a few weeks. Outside in a garden, tomato plants would be pollinated by bees moving pollen from one flower to the next. Since I don't have bees inside over winter, Miriam needed a little help to set fruit. As long as we have sun every once in awhile this winter, the fruit will turn color. If not, I can either pick them and use them green, or place them inside a brown paper bag and add an apple to accelerate the ripening process. Miriam Tomato also has new flowers branching off the stems, more tomatoes in the works! Assuming nothing untoward happens to Miriam, such as a cat knocking her over, she will go outside after the danger of the last frost of the season, around May. I may re-pot her then into a larger pot with compost to keep her happy but so far, she seems to be doing quite well. Have you tried to grow a tomato inside over winter?